Life can be challenging as you get older. The world seems to be whizzing by and your body doesn’t respond as it did just a few years ago. Everyday things like phone numbers and names are easily forgotten. For many seniors, routine tasks, such as arranging a ride to the doctor, sorting through mail, and making sure that benefits are in place can seem insurmountable. And obstacles mount when English is not your primary language. 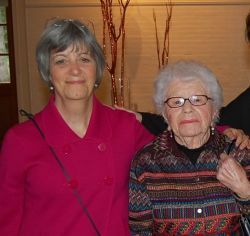 Those who live at Jewish Community Housing for the Elderly (JCHE) don’t need to ‘go it alone.’ They have access to an amazing resource, the JCHE Resident Services Coordinator staff, which provides an invaluable connection to the larger community. Recently, this team of skilled, committed staff collaborated on a presentation designed to give our board insight into the multi-faceted nature of their jobs. This was done in a “day in the life of…” format, detailing on an hour by hour basis the demanding tasks and responsibilities that make up their days as advocates, service coordinators, referral sources, translators, and listeners. What emerged was a picture of connection. A resident who didn’t understand the food stamp office’s request for an annual redetermination had his benefits terminated. Though the help of a RSC, he was reinstated on the program. A resident kept calling the police about non-existent noises in her apartment; in turn, the officers left messages for the JCHE office about this problematic behavior. The RSC was able to connect her to mental health services and she’s sleeping peacefully at night now. Residents, especially non-native English speakers, are often confused by junk mail and fear it is “official” and demands payment. RSC routinely help residents sort through mail, determine what needs attention and action, and what can be safely tossed away. A resident who, despite living alone and having no family in the area, was discharged from the hospital even though the doctor wanted her to be awakened every two hours. The RSC made arrangements so that the resident was visited throughout the night in the safety and comfort of her own home. Overall, 25 “typical” scenarios were shared, and in all cases the RSC staff were able to advocate for the residents, forming the connection to the world that they would otherwise just not have. JCHE’s 11-person resident services team is truly an outstanding group of human services providers. All are certified or working towards certification in Service Coordination. Four are master’s level social workers and 4 have certificates in aging from Boston University. Collectively, they speak 12 different languages – each of which is useful in our multi-lingual buildings. And they are clearly one of the many elements that make JCHE the leader in providing a continuum of progressive, proven services that allow aging residents to maintain their well being and independence.